I’m ginger and very, very fair – so summer spells nothing but sun burn and freckles for me! I really want to get a little bit of colour this year, even if it is fake. I’ve never tried fake tan before so didn’t want to go down that route; instead I picked up this Dove Derma Spa Summer Revived self tanning lotion (currently on sale for £3.50!) . I’m hoping this works wonders and gives me the naturally splash of colour I’m after – I tried a self tanning moisturiser once when I was 14 and had umpa lumpa legs…wish me luck! If you’re new here; Hi, I’m Lauren and I’m obsessed with watermelon. When I last went abroad I bought myself a watermelon body mist so I didn’t have to travel with glass perfume bottles, and again this year I’ve bought another! Whilst these fragrances tend to not always smell exactly like watermelon, I appreciate the concept and it does smell deliciously fruity. The Delicious Destinations range has many scents but I picked up the Watermelon & White Lotus scent for around £3. I love Barry M nail varnishes, they’re some of the best, but I’ve never tried any makeup from the brand. I’ve been on the hunt for an illuminating setting spray for the summer and the Barry M Cosmetics Illuminating Makeup Setting and Body Spray stood out to me, and for around £5 I thought I’d give it a go. Have you tried this out? I’m hoping I won’t be showered in glitter and transported back to the 90’s, but hey, I’m up for anything. Do you ever have one of those months where all your ride or die products run out at once? That has definitely been me this month! My Clinique Easy Liquid Liner ran out after months of love…RIP, but it’s time to move on to other things I feel. There was lots of hype around the Wing Woman liner by Lottie London late last year but I had just bought my Clinique one so didn’t dare cheat on my beloved. Now, however, I’m ready to give this a shot! Is it even summer if you don’t just throw some bronzer in the crease with a copper eye and head out to the beach? I am in awe at how amazing this eyeshadow looks you guys, I have extremely high expectations. These are the Barry M Cosmetics Crushed Jewel Cream Eyeshadows and I have the shade Fairytale which is an extremely vibrant copper shade. The pigmentation is insane and it was very budge-proof when I swatched it in store, so can’t wait to give this a go. Finally, the whole purpose of my shopping trip, is this Revlon Ultra HD Matte Lipcolor in Flirtation. I have a disgusting amount of lipsticks already but no coral shades to be seen, and I always long for a coral lip on holiday! 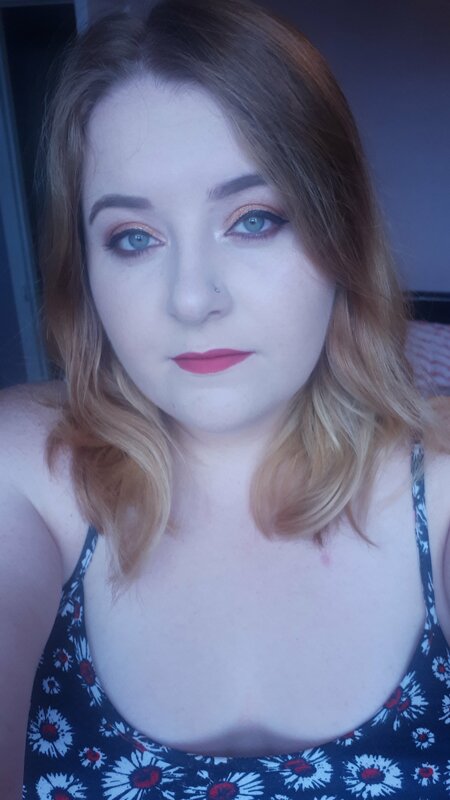 I didn’t have much choice if I’m honest, it’s seems everyone else also wanted a coral lip this weekend, but I found this beauty and am confident with my choice. Can’t wait to do a review for you guys!